Further improves the accuracy of the DS-TTL’s excellent performance. 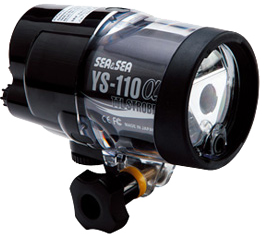 This is a new type of strobe building and improving on the basic functionality of the YS-110. 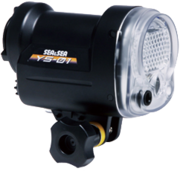 *When the YS-110α strobe is used with a compact digital camera in a housing, use the Fiber-Optic Cable (L-type)50107. 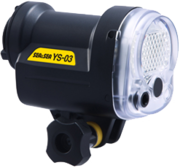 *YS-110α strobe has been minor-upgraded from ones built in September 2010. The upgraded YS-110α is called YS-110α Ver. 1.1. *Marking of Ver.1.1 is found on the side of the main body below the serial number. 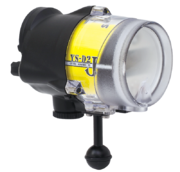 *The Fiber-Optic Cable and the Strobe Mask Set are required when using the SEA&SEA strobe with a waterproof case made by another company. The YS-110α introduces numerous new exciting functions, opening a whole new digital generation. For example, by connecting it to digital cameras with pre-flash function using a fiber-optic cable, the YS-110α can be used in the fully automatic DS-TTL adjustment mode (Digital Slave TTL). Enjoy complete creative control – when you want absolute control over fine light adjustments, you can use a main strobe in DS-TTL mode and a secondary strobe in manual mode or you can set up an advanced lighting system using two strobes in DS-TTL mode. The DS-TTL adjustment function is also available using the light level control dial for fine control of the light amount when taking pictures in DS-TTL mode. You can also choose from 13 levels of manual controls when you do not want to leave the light adjustment up to the camera. The flat, round, 105° beam angle (with diffuser), achieved by the balanced positioning of the 3 flash tubes, and the power of a Guide Number 22 are examples of the excellent performance of the strobe that is sure to satisfy even the most demanding professionals. *1 Number of flashes and recycle time depends on the battery brand, temperature and frequency of use. *2 Number of flashes and recycle time of Ni-MH batteries were tested on 2700mAh batteries.